FAR WEST EDITIONS was begun in 1968 by John Pentland, a direct pupil of G. I. Gurdjieff and president of the Gurdjieff Foundations of New York and California until his death in 1984. Its original purpose was to discover if a more impartial quality of spiritual thought can emerge when a small group of people work at writing while at the same time trying to see themselves as they are. Our hope is to communicate a kind of insight or vision that throws light on our common situation without arousing false expectations or helpless reactions of self-esteem and self-pity. With the increasing tendency to mobilize and make public the scattered fragments of traditional teachings and culture, such critical thought is more needed now than ever. But even the experimental study of it goes against the grain. What does it mean to be practical, spiritually? Surely the real sense of community, so universally wished for, cannot exist without each of us learning to think. For this, of course, the mind must be trained to watch attentively, remember impressions and recombine them in an original way. But that can be done by any opinionated man or woman and perhaps, to some extent, even by a computer. In any case, there is also needed the little boy who told the emperor he had no clothes on, an inner movement which frees the thinker himself from his self-love and passivity. We have chosen to offer essays and reviews of books dealing with psychology and man's situation on earth, as well as studies and translations on subjects including crafts and the modes of action of the human body. Since the contributions are partly of plural authorship, many of them are not signed. The journal Material for Thought has been Far West Editions' principal publication. Since 1970 fifteen issues of Material for Thought have been published, many of which are available through this web site. Please go to Selected Articles from Past Issues of Material for Thought for a sample of articles and reviews. 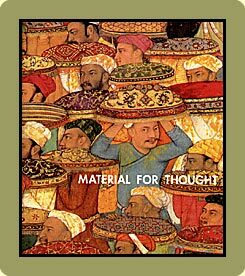 We are now working toward an on-line issue of Material for Thought . See Works in Progress for new articles and reviews that we are presenting for your consideration. Far West Editions has also published Transitional Man by Franklin Earnest III and The Uses of Life , a dialogue between Ruth Cooke and Jacob Needleman.Both publications may be ordered through this web site. In addition, Far West Institute, an allied not-for-profit organization, has published a number of books which are now out of print but can often be located through book services. These include several lecture series produced in San Francisco and edited for publication by Jacob Needleman: Sacred Tradition and Present Need , On the Way to Self-Knowledge, The Search: What Are We Searching for? and Speaking of My Life: The Art of Living in the Cultural Revolution. Published translations include Toward Awakening by Jean Vaysse, The Life of Milarepa (translated from the Tibetan under the guidance of Lobsang Lhalungpa and still in print), and Her-Bak, Egyptian Initiate: Commentaries by Isha Schwaller de Lubicz.